A good tasting caramel is such a treat. This recipe for homemade Caramels produces a soft and chewy candy with a wonderfully smooth and creamy texture. I like how you can cut the caramels into any size or shape you like. Maybe you prefer small individual bite-sized squares that you can just pop into your mouth. Or maybe you want long thin strips that can be wrapped in wax paper, twisting the ends to keep the Caramels fresh. Homemade Caramels are perfect for gift giving or you may want to make a batch or two for your next bake sale. 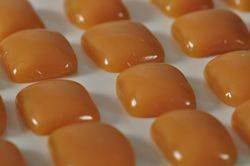 The process of making Caramels is not difficult, but a few things should be observed. First, try not to make candy on a humid day unless you have adequate air conditioning. And try to use a heavy duty saucepan so the caramel doesn't scorch under high temperatures. Be sure to use a wooden spoon to stir the syrup as the sugar crystals will not stick to wood as easily as they will to metal. And most importantly, buy a accurate candy thermometer with a metal clip so you can fasten it to the side of the pan. Now, candy thermometers are fragile so after each use place in hot water (not cold) to dissolve the sugar coating. Never place a hot thermometer into cold water as this can cause it to break. And be sure to store your thermometer away from other kitchen utensils so it won't get banged around. Lastly, cleaning the saucepan can be a problem. The best way to remove all that hard caramelized sugar is to fill the saucepan with water and bring it to a boil. Turn off the heat and let it sit until the sugar dissolves. Now, the important part. To prevent sugar crystallization, which means your caramels will have a grainy texture, make sure to stir the ingredients constantly until they reach the boiling point. (This ensures that the sugars have completely melted.) I find it best not stir the boiling syrup, just brush down the sides of the pan, with a heatproof pastry brush that has been dipped in warm water, to remove any sugar crystals that may have formed on the sides of the saucepan. Watch the caramel closely and remove from heat once it reaches 250 degrees F (121 degrees C). If you prefer a softer Caramel, cook until it reaches 245 degrees F (118 degrees C). For a firmer Caramel, cook until it reaches 255 degrees F (124 degrees C). Caramels: Line an 8 inch (20 cm) square baking pan with aluminum foil and then lightly butter the foil. Remove from heat and stir in the vanilla extract, salt, and butter. Pour the caramel into your prepared pan and let cool, undisturbed, until firm (at least two hours). With a sharp knife or pizza cutter, cut into squares or rectangles. Can wrap the caramels in wax paper or cellophane. These caramels can be stored at room temperature (or in the refrigerator), between layers of wax paper, for a couple of weeks. Makes 64 one-inch square Caramels. Preparation time 40 minutes.